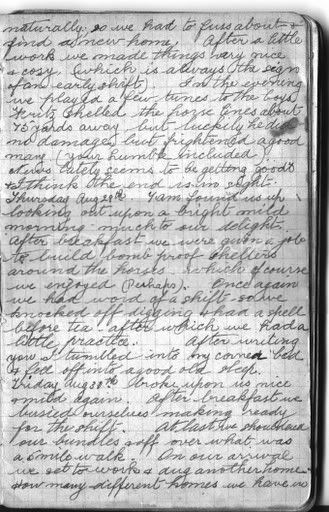 Wednesday Aug 28th broke upon us rainy & dull so we rose a little later & had breakfast at 9am, after which we had orders to pack again & go back to where we came from (how like the military). Anyhow we had to go & that was the end of it, so we shouldered our packs & went back to find our previous homes occupied, naturally, so we had to fuss about & find a new home. After a little work we made things very nice and cosy (which is always the sign of an early shift). In the evening we played a few tunes for the boys. Fritz shelled the horse lines about 75 yards away, but luckily he did no damage but frightened a good many (your humble included). News lately seems to be getting good & I think the end is in sight. Monday Aug 28th was cloudy, after at least one short heavy shower of rain during the night. Struck down by a nasty headache, which kept me debilitated most of the day. Varnished yesterday's wood-butchering project in the afternoon, just before the next line of storms arrived with some very nice rain.